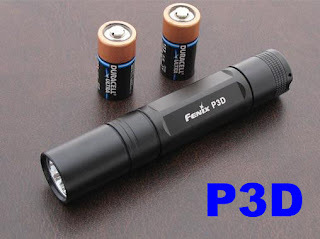 The Fenix P3D is a 2 cell flashlight using lithium 123 batteries with the same interface as the Fenix L1DCE and P2D. The light has two modes of operation that can be selected twising or untwisting the head. Each mode of operation has different settings that can be selected pressing the tailcap button. In the first mode you can select either "turbo" mode for maximum brightness or the strobe. In the second mode of operation the settings are minimum, medium, maximum and then SOS. If you are in any of the settings twisting or untwisting the head will take you to turbo or minimum mode automatically so you have the brightest and lowest mode always available without needing a click. The ligh uses a Cree LED so it is extremely bright up to about 150 lumen in turbo mode. Runtime goes from 1.8 hours in turbo mode to 65 hours in the lowest mode. The flashlight is regulated meaning that regardless of the battery status the amount of light produced is always the same for a given setting. Even in turbo mode the runtime is very good so this light is a really useful light for several applications and the multiple brightness settings give it versatility. The beam is a good combination of throw and sidespill, there are some minor flaws and artifacts due to the LED being slightly offcentered that are common in Cree LED flashlights. The tint is much better in the P3D than in the P2D being whiter with some P3Ds having a bluish tint, no green/yellow tints as in the P2D. As a 2 cell light it is too big for a keychain but it can be your EDC light if you like the interface and the specifications. You can order from Fenix Store for $62. This is an interesting novelty pen, it works as a normal pen with the adition of having a retractable scroll of paper inside the cap. 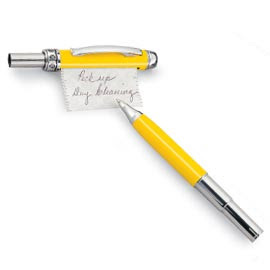 The pen uses a cartrdige of paper 2 inches wide and 24 inches long, you can write with the pen in the scroll of paper and then either cut it or retract it inside the cap. The top of the cap rotates to scroll or unscroll the paper inside. The pen is very useful for shopping lists, taking quick notes in a hurry, phone numbers, email addresses or things you need to remember like an improvised to-do list. You only need the pen to have both a writing tool and some paper. The pen is made of brass and chrome parts with a laquered finish, it weights about 2 oz and feels solid in the hand. The pen comes with two refills and black ink. You can order for $20 from this site.